There are days when we are all on board with what we’re having for dinner. 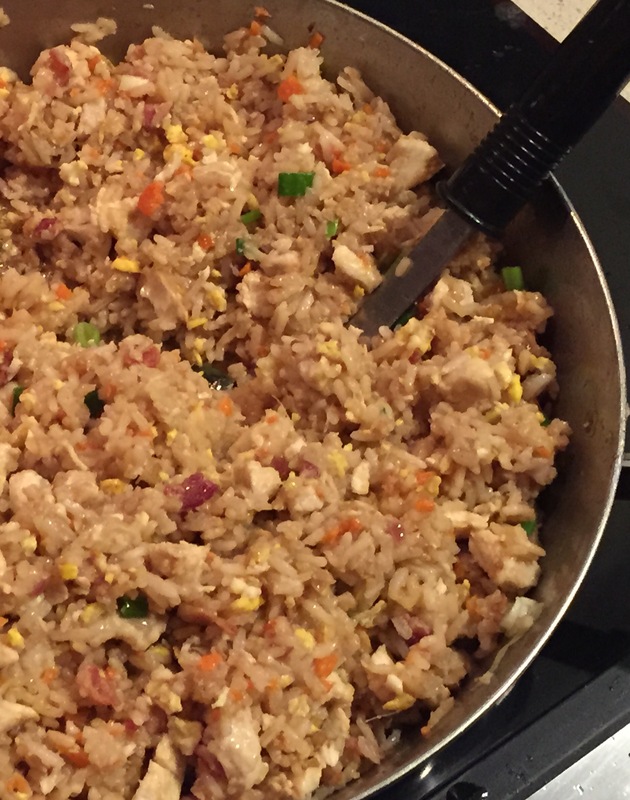 The other night it was this recipe so I got to work the night before because for whatever reason, fried rice is best made with cooked rice that is cold. This was pretty tasty and we were all pleased. It’s not like the fried rice that is served at our favorite Hibachi place, but it’ll suffice in between times. Cut bacon into small pieces and cook in a large fry pan over medium-high heat, until done, but not quite crispy. Remove the bacon to a plate lined with paper towels to soak up the remaining grease. In the skillet with the bacon grease, cook the chicken all the way through. Remove from heat and chop into small pieces. In the same skillet, (add some oil if you need to) add in the beaten eggs. Do not stir, let sit until set, about 2 minutes. Flip egg over and allow to cook for another minute or so. Remove from skillet and transfer to a plate to cool and chop into small pieces. Add vegetable oil to the pan, still at medium high heat. Add carrots and onion to the pan. Cook, stirring constantly, until the onions are transparent. Add garlic and ginger, cooking for another 2 minutes, stirring regularly. Add in the rice, soy sauce, teriyaki glaze, sesame oil, and white pepper. Stir together until everything is well combined and heated, approximately 5 minutes. Add in the egg, bacon, and green onion, stir to combine & serve. This entry was posted in Asian, Chicken. Bookmark the permalink.